December is here ... yeay!! How fast is that? So many things in my to-do-list yet so little time to accomplish *sigh*. Soon we will have Christmas and enter a new year. It might sound so rushing but I can tell days in December flown away pretty quick. Hubby's birthday is coming in another 4 days and I'm still blank, don't know what to prepare for his birthday gift. Kids have been asking when I will take them to buy hubby's birthday gift. They want to choose by themselves, each one of us will have different birthday gifts for hubby. Kids usually will pick up something 'amazing' that we as an adult will never think about it. I used my various small cutters to make boy and girl with their Christmas outfits. As usual, using cutters save me a lot of time. Inside the yellow box : strawberries, braised peanuts, stir fried Chinese okra, crab meats in tomato garlic sauce, and spam wrapped in egg. They both are so lovely! @Journal Mommy Yenny : I think is easier to choose a gift for woman than for a man hehehe ... Thanks a lot Yen! Lucu bgt!!! Btw, itu bikin orang dan rambutnya nya pake cutter atau potong manual mbak? Your egg sheet creations blow me away! These Christmas kids are so cute! 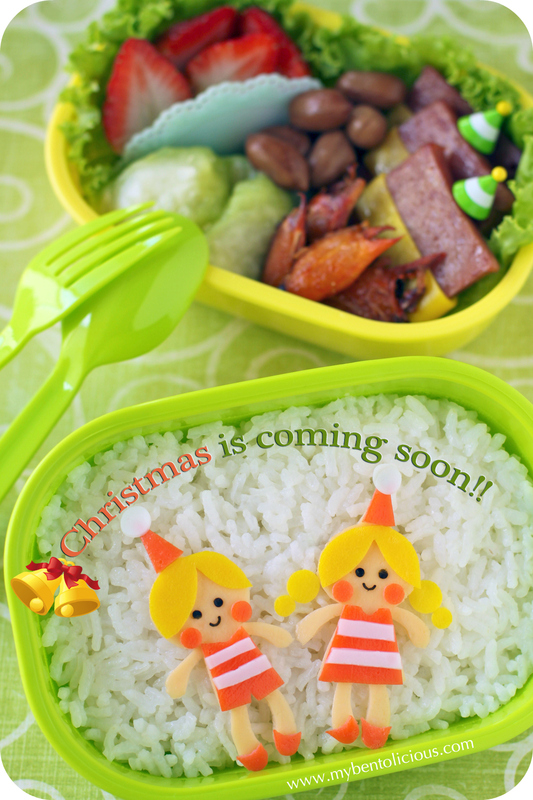 jingle bell...jinger bell...X'mas is coming soon!!! I also have the same X'mas feel after seeing this bento..so adorable, Lia. Buying gifts for hubby is the most headache problem for us too...hehe. I agree, the year has gone so fast! You do so well with your cutters - whenever I try to use them, the food tears :-( The stripes are wonderful too. @Stretching My Imagination : Thanks a lot! Egg sheet is easy to cut with cutter because they are soft. I might have a problem if I use it for carrot or cucumber since the cutters are made of plastic. Lia, so cute pair! Aaaw, wish I could actually wear those Christmas outfits! Feels so sunny and warm ^_^. So bright and cheery, I love how this bento brings a summery warmth this celebration...yellow, orange and white are beautiful together! @bentobird : Love to read your comment, always so kind. Thanks a lot dear friend! Good luck buying your husband's gift! I'm having a hard time figuring out an xmas gift for mine, so difficult to buy for! !